This gripping account of the emotional impact of losing a loved one in battle was written about a small village in Pennsylvania when word reached them of their grievous losses at Gettysburg. The same scenario played out 81 years later when word reached Bedford, Virginia, of the fate of their local military unit during the D-Day invasion at Normandy in 1944. Bedford’s Virginia National Guard unit lost 19 of its 34 men on the first day of the invasion and four more in subsequent battle, a horrific fatality rate of nearly 70 percent. Accordingly, this small town in the foothills of the Blue Ridge Mountains was selected to be the location of our National D-Day Memorial. I recall community support in World War II when a blue-star flag in a window indicated a family member serving in the military, while a gold-star flag symbolized the death of that soldier, sailor, marine or airman. Everyone pitched in with Victory Gardens, working overtime, rationing scarce resources, and a joyous celebration with church bells ringing when the war finally ended. My father served in World War I and my brother in the Korean conflict. Though neither saw combat, each of their coffins was draped with an American flag for having served during wartime. And like most American families, we were well aware of the higher price being paid by others for our freedom. My father bought our first house from a man named Howard Keniston, a print setter and later a bus driver … an ordinary man. But Howard lost his two sons, his only children, on the USS Arizona at Pearl Harbor on Dec. 7, 1941. When a young man in uniform boarded his bus in those painful years after the war, Howard had to be experiencing some of that searing sadness that stays forever with Gold Star parents, friends, and family members. Likewise with my brother, it was not him but his best buddy from high school, Leigh Whitaker, who had a horrific term of service of Korea. An army medic, Leigh had been on the ground in Korea for only two weeks when his unit was overrun by a pre-dawn attack south of Seoul. Leigh initially escaped but was soon captured and lined up with others for execution. Leigh said that some of the American soldiers facing a machine gun began reciting the Lord’s Prayer. A last-minute reprieve saved them since the commanding enemy officer decided that they were more valuable as prisoners than dead. Leigh subsequently spent 37 agonizing months as a prisoner of war, though his family never knew even that as Leigh was always listed as an MIA, missing in action. He had dropped to 85 pounds. You may well have this type of linkage to those we honor on Memorial Day for their service to this country. You likely did not serve yourself — though we honor you if you did or are currently serving — but have a friend, relative, or neighbor who served in past wars, including Viet Nam, Iraq, and Afghanistan, and who may have lost their life, a limb, their health, or be scarred by other afflictions. I did not serve in the military, but have such a strong connection to the stories of those who did that I am emotionally stirred by the service and sacrifice of others. And I feel a surge of patriotic pride when I salute the flag and sing our National Anthem. May that flag forever wave over the land of the free and the home of the brave. All gave some, some gave all. May they rest in peace. 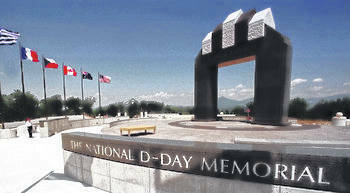 James Burns Guest columnist Courtesy photo The National D-Day Memorial is in Bedford, Virginia. It serves as the national memorial for American D-Day veterans. https://www.galioninquirer.com/wp-content/uploads/sites/38/2018/05/web1_James-Burns-1.jpgJames Burns Guest columnist Courtesy photo The National D-Day Memorial is in Bedford, Virginia. It serves as the national memorial for American D-Day veterans.